On the Saturday morning of September 28, 1996, bookmaker Gary Wiltshire was driving along the M40, heading for Worcester racecourse where he had decided to pitch for the day. But a huge tailback of traffic made him change his mind. Abandoning the humble fare of a Midlands jumps meeting, Wiltshire decided to turn around and head for Ascot instead. It was a decision that was to change his life forever. He was about to become the biggest casualty of Dettori Day. As Wiltshire set up on his lowly rails pitch, around the country, and on the course, mug punters were filling out slips for multiple bets and accumulators on some of Frankie Dettori’s seven rides at Ascot. Some fools were even placing money on Dettori to win all seven races, something that had never been done in the history of horseracing. Long, long ago, Gordon Richards and Alec Russell had each gone through a six-race card at far humbler meetings. But winning all seven races at a prestigious meeting like that Ascot Saturday? Come off it. The day started quietly for Wiltshire, who was hardly involved as Dettori won the first race, then the second, then third … and then the fourth. Suddenly interest picked up. The BBC, who had planned to show only the first four races, decided to stick with the remainder of the meeting. It was the fifth race, the Rosemary Dated Stakes, that began Wiltshire’s nightmare. Dettori was riding a filly called Fatefully, who in the morning prices had been quoted at 9/2. But in the Ascot betting ring, the big firms were now trying to limit the damage from Dettori having ridden the first four winners. Fatefully opened at 5/2 and was well backed down to 13/8. At that point Wiltshire was £800 up on the day. Hardly big money, but modestly respectable. Now he decided to make some real money. Fatefully was being offered at less than 2/1 for what, a few hours earlier, had been a more than double those odds. Do me a favour. Wiltshire started laying bets on Fatefully. Fatefully, with Dettori on board, started at 7/4 and won by a neck. It wasn’t fear – or common sense – that prevented Wiltshire from getting involved in the sixth race. Along with everyone else, he simply fancied Dettori to win it on the 5/4 favourite, Loch Angel. In the seventh race, though, Dettori was aboard an old gelding named Fujiyama Crest. In the morning papers, Fujiyama Crest had been generally around 12/1 and at one stage had even gone out to 20/1. But now punters around Britain were putting their money on history being made. Of course, this meant that Fujiyama Crest’s odds were tumbling. But even all that weight of money didn’t mean that the horse could run any faster. As far as Gary Wiltshire was concerned, Fujiyama Crest was still “a dog”. And laying “dogs” had long been how the jolly, fat bookmaker had made a living so comfortable that he owned a five-bedroomed house near Towcester, a cottage in Norfolk, a villa in Portugal, two Mercedes E320 convertibles, and several racehorses. The bookmaker had no problem in taking a £5,000 bet at 4/1 from fellow bookie Roy Christie. That was the start of the avalanche that was about to engulf Gary Wiltshire. With the big bookmakers on the rails now going as low as 6/4, and the off-course bookies trying to force the price to a damage-limiting odds-on, the man who should have been having a quiet day at Worcester was still calling out 3/1 and attracting plenty of takers. It was the proverbial licence to print money. Or so he thought. By the off, Fujiyama Crest was down to 2/1 around the course. But Wiltshire’s little pitch was where all the focus was. On that single race, he had taken almost £1 million in bets, nearly half a million of it from Coral alone, at odds varying from 7/2 to 9/4. 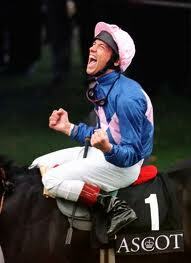 And, of course, as we all now know, Lanfranco Dettori rode Fujiyama Crest to victory by a neck. History had indeed been made. And Gary Wiltshire had been ruined. That night, at Milton Keynes dogs, the first bet he took was from a punter who wanted £1 on a 2-1 shot. It was going to be a long way back. But back he fought. 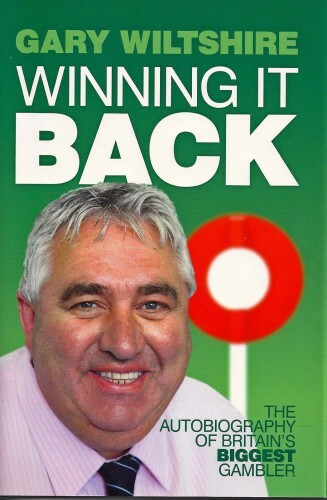 And that was probably why, at the end of it all, he chose to write his autobiography, Winning It All Back, in which Wiltshire tells not only the full story of that fateful day at Ascot, and its blistering aftermath, but also how he came to be a bookmaker in the first place and all the roller-coaster moments of a life more full of fun and laughter than of gloom and doom. From working on a flower stall in Leather Lane market (a regular patron was “keen gardener” Violet Kray, doting mum of Ronnie and Reggie) to fame as the Bookie Who Lost A Million, Wiltshire’s story is fast and entertaining. He refers to himself as a Cockney when, in fact, he was born and raised in Islington. Of course, a cheery Cockney is a better image for a Jack-the-Lad bookie, but as Wiltshire is (cliché alert) already a larger-than-life character, there is no need for such embellishment. From the age of five or six, he could calculate odds, and all he ever wanted to do was be a bookie. It seems to be in his blood: his paternal grandfather and his maternal grandmother both liked a daily punt. At an early age he sought counselling for a gambling addiction. He was a good young footballer, although it takes some imagination to picture the 32st “Belly From Telly” – he is a familiar face on BBC’s horseracing coverage and on Sky’s nights at the dogs programmes – as a goalkeeper once good enough to play for Islington schoolboys and attract Leyton Orient’s brief attention. After his Ascot nightmare, Wiltshire had two stark choices: walk away from his legally unenforceable gambling debts and be warned off every racecourse, his bookmaking career over; or sell everything he owned, pay off every penny, and start again. Wiltshire chose the latter course. His first port of call was to see Coral’s Trevor Beaumont, who told him, “You’ve got a good name and, if you say you will pay, then I know you will.” And he did. Wed Apr 13: SJA 2011 Annual Meeting, at offices of UK Sport, Russell Square. Strictly SJA members only. Wed Dec 7: SJA 2011 British Sports Awards – note the date in your diary now.